Pine Trees And Pearls: UGGS are no longer UGLY! UGGS are no longer UGLY! I just got a pair of the classic Tall UGG boots that I swear by for our cold and snowy Maine winters. I have had a pair of these for about 3 years now and they are the only thing that gets me through! It was time for a new pair since the ones I got three years ago are (or should I say were) light blue to match with the light blue UGG bag that I got when they first were getting popular. (I don't recommend getting a pair of UGGS in light blue:-( So I just got a pair of Classic Talls in brown. Much better. However I think I need to send them back since I forgot that they run big and they are not available in half sizes. So, just say you wear an 8 1/2 then you will want to order an 8, not a 9. OK, but here is my debate. 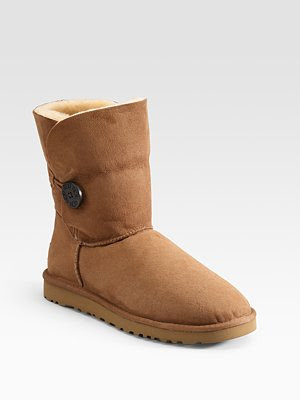 My friend Cindy just bought a pair of the Bailey Button UGGS and they are so cute!!!! She got them right at Lamey Wellehan (which is right across from Starbucks by the mall:-) They certainly wouldn't get me through the worst of our Maine winter storms, but they would be such a cute boot to wear with skinny jeans or leggings on my days off!!! Ok, I need to rethink here. I already have my light blue Tall UGGS that actually could take me through the season yet again, so I may be sending those Brown Talls back and getting the adorable Bailey Buttons!!!! Now.......what color should I get?????? Okay, I love my Uggs. I was hesitant to buy, not because I though they were ugly, but because I didn't want to look like a sloppy coed. They are perfect for what they are meant for; mild icky weather. LOVE, love, love mine. Except now I want a new Bailey Button pair!